A classic anthology for GCSE. The eight sections of adapted prose include sections from Apuleius, Caesar, Cicero, Pliny, Sallust, Tacitus, and the Acts of the Apostles in the Vulgate. Glosses and other explanations are provided opposite each of the texts, and the writing is illustrated throughout by paintings and photographs of artifacts and places in the Roman world. For the student, there is a complete vocabulary at the end of the book, and, for the teacher, there is an accompanying handbook giving additional information and suggestions for discussion and work in the classroom. 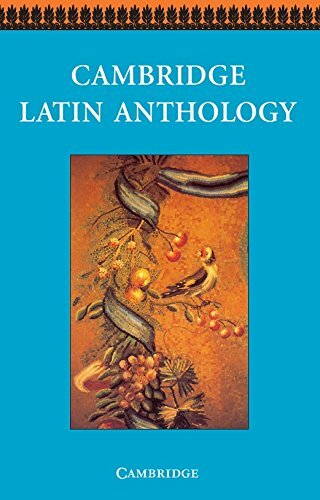 Orpheus et Eurydice (Virgil); Nisus et Euryalus (Virgil); Echo et Narcissus (Ovid); Baucis et Philemon (Ovid); amor (Catullus, martial, Ovid, Horace, Petronius); Otium (Martial, Horace, Catullus, Ovid); vita rustica et vita urbna (Martial, Ovid, Horace); de cultu deorum et vita hominum (Horace, martial, Virgil, Seneca, Lucretius); Germanicus et Piso (Tacitus); Messalina (Tacitus); avunculus meus (Pliny); sagae Thessalae (Apuleius); tres feminae (Pliny); personae non gratae (Cicero, Pliny, Sallust); Druides (Caesar, Tacitus, Pliny the Elder); tumultus et rebellio (Tacitus, Vulgate); Vocabulary.